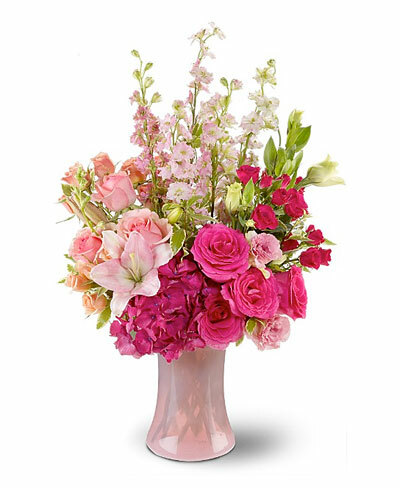 Get the birthday party started with this stunning bouquet of pink lilies, salmon and pink roses and a mix of towering blossoms and greenery. Pink Asiatic lilies, larkspur and lisianthus - plus hot pink and light pink roses, salmon spray roses and burgundy hydrangea, accented with bupleurum and variegated pittosporum. You can add a vase below. Due to heavy demand, vase substitution may be necessary depending on availability.